"Wolsit" redirects here. For the cycling team, see Wolsit (cycling team). Wolseley Motors Limited was a British motor vehicle manufacturer founded in early 1901 by the Vickers armaments combine in conjunction with Herbert Austin. It initially made a full range topped by large luxury cars and dominated the market in the Edwardian era. 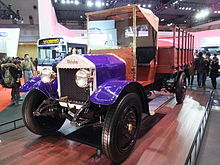 The Vickers brothers died[note 1] and without their guidance Wolseley expanded rapidly after the war, manufacturing 12,000 cars in 1921, and remained the biggest motor manufacturer in Britain. Over-expansion led to receivership in 1927 when it was bought from Vickers Limited by William Morris as a personal investment and years later moved into his Morris Motors empire just before the Second World War. After that its products were "badge-engineered" Morris cars. Wolseley went with its sister businesses into BMC, BMH and British Leyland, where its name lapsed in 1975. Hiram Maxim, inventor of the machine gun that bears his name and by then a member of the combine Vickers Sons & Maxim, had consulted Herbert Austin at Wolseley in the late 1890s a number of times in relation to the design of flying machines, which he was developing and constructing. Maxim made use of a number of suggestions made by Austin in Maxim's activities at his works in Crayford, Kent. Once the sheep-shearing company had decided they would not pursue their automobile interest an approach was made and agreement quickly reached. The Wolseley Tool and Motor Car Company of Adderley Park Birmingham was incorporated in March 1901 with a capital of £40,000 by Vickers, Sons and Maxim to manufacture motor cars and machine tools. The managing director was Herbert Austin. The cars and the Wolseley name came from Austin's exploratory venture for The Wolseley Sheep Shearing Machine Company Limited, run since the early 1890s by the now 33-year-old Austin. Wolseley's board had decided not to enter the business and Maxim and the Vickers brothers picked it up. After his five-year contract with The Wolseley Tool and Motor Car Company ended Austin founded The Austin Motor Company Limited. Austin had been searching for other products for WSSMC because sale of sheep-shearing machinery was a highly seasonal trade. About 1895–96 he became interested in engines and automobiles. During the winter of 1895–96, working in his own time at nights and weekends, he made his own version of a design by Léon Bollée that he had seen in Paris. Later he found that another British group had bought the rights and he had to come up with a design of his own, having persuaded the directors of WSSMC to invest in the necessary machinery. In 1897 Austin's second Wolseley car, the Wolseley Autocar No. 1 was revealed. It was a three-wheeled design (one front, two rear) featuring independent rear suspension, mid-engine and back to back seating for two adults. It was not successful and although advertised for sale, none were sold. The third Wolseley car, the four-wheeled Wolseley "Voiturette" followed in 1899. A further four-wheeled car was made in 1900. The 1901 Wolseley Gasoline Carriage featured a steering wheel instead of a tiller. The first Wolseley cars sold to the public were based on the "Voiturette", but production did not get underway until 1901, by which time the board of WSSMC had lost interest in the nascent motor industry. The company had been formed in March 1901. By 1 May 1901 Austin had issued his first catalogue. There were to be two models, 5 hp and 10 hp. They were both available with either a Tonneau or a Phaeton body with either pneumatic or solid tyres. For an additional outlay of thirty shillings (£1.50) the 10 hp model would be fitted with a sprag to prevent it running backwards. "We recommend pneumatic tyres for all cars required to run over twenty miles an hour. Austin then provided a paragraph as to why his horizontal engines were better lubricated (than vertical engines) and that 750 rpm, the speed of his Wolseley engines, avoided the short life of competing engines that ran between 1,000 and 2,000 rpm." 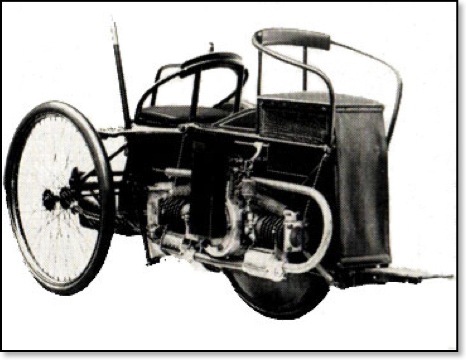 in 1904 Queen Alexandra bought a 5.2-litre 24 hp landaulette with coil ignition, a four-speed gearbox and chain drive. However a tendency then arose for journalists to follow the company's full-page display advertising and drop the first word in Wolseley Siddeley — "Siddeley Autocars made by (in smaller typeface) the Wolseley Tool . . ." Certainly it was true the new engines were named Siddeley engines. Meanwhile, under Siddeley Wolseley maintained the sales lead left to him by Austin but, now run from London not (Austin's base) Birmingham, the whole business failed to cover overheads. A board member, Walter Chetwynd, was set to find a solution. It was decided the business operated from too many different locations. First the board closed the Crayford Kent works, moving the whole operation back to Birmingham and dropping production of commercial vehicles and taxicabs – a large number of which, 500+, were made during Siddeley's time including an early 10 hp taxicab made in 1908 sold to a Mr W R Morris of Holywell St. Oxford who ran a garage there and hire car business as well as making bicycles. Then the London head office followed. After some heated discussions Siddeley resigned in the spring of 1909 and Rothschild went too. Ernest Hopwood was appointed managing director in August 1909. Siddeley was to go on to manage the Deasy Motor Company and a notable commercial career. Wolseley was not then as specialised in its operations as members of the motor industry were to become. For other members of the Vickers group they were general engineers and they also handled engineering enquiries directed on to them by other group members. Wolseley built double-decker buses for the Birmingham Corporation. They also built many specials such as electric lighting sets and motor boat engines – catalogued sizes were from 12 hp to 250 hp with up to twelve cylinders and complete with gearboxes. Fire engines too and special War Office vehicles being a subsidiary of a major armaments firm. As befits a company with tool in its name they built machine tools including turret lathes and horizontal borers though chiefly for their own use or for group members. Very large engines were made to power railcars, those made for the Delaware and Hudson railroad powered a petrol-electric system. While at first Wolseley supplied engines for launches, made for them by Teddington Launch Works, they moved on to small river craft and light coasting boats. The demand for engines for larger vessels grew. It was not uncommon for orders to be booked for 70-foot (21 m) yachts, racing launches and ferry boats to carry fifty or more passengers. These were manufactured by S E Saunders Limited at Cowes, Isle of Wight. Special engines were made for lifeboats. In 1906 horizontal engines of sixteen cylinders were designed and constructed for British submarines. They were designed to run at a low speed. High efficiency V8 engines were made for hydroplanes as well as straight eights to run on petrol or paraffin. Weight was very important and these engines were of advanced design. The airship Mayfly was fitted with Wolseley engines. The Scottish Horse Mounted Brigade's Field Ambulance developed an operating car, designed by Colonel H. Wade in 1914, which enclosed an operating table, sterilisers, full kit of instruments and surgical equipment, wire netting, rope, axes and electric lighting in a Wolseley car chassis. This operating car was employed during the Gallipoli Campaign at Suvla, in the Libyan Desert (during the Senussi Campaign) and at Kantara in Egypt, before being attached to the Desert Mounted Corps Operating Unit in 1917. Subsequently, taking part in the Southern Palestine Offensive, which culminated in the Capture of Jerusalem. In 1918, Wolseley began a joint venture in Tokyo, with Ishikawajiama Ship Building and Engineering. The first Japanese-built Wolseley car rolled off the line in 1922. After World War II the Japan venture was reorganized, renaming itself Isuzu Motors in 1949. Wolseley duly took over the Ward End, Birmingham munitions factory from Vickers in 1919 and purchased a site for a new showroom and offices in London's Piccadilly by the Ritz Hotel. Over £250,000 was spent on the magnificent new building, Wolseley House. This was more than double their profits for 1919, when rewarding government contracts were still running. Those contracts ended. The government then brought in a special tax on "excess wartime profits". There was a moulders' strike from December 1919 to April 1920, but in spite of that it was decided to continue the manufacture of other parts. Then a short, sharp general trade slump peaked in July 1920 and almost every order Wolseley had on its books was cancelled. In 1920 Wolseley had reported a loss of £83,000. The following years showed even greater losses. Next, in October 1922, W R Morris startled the whole motor industry by a substantial reduction in the price of his cars. In 1924, Wolseley's annual loss would reach £364,000. Ernest Hopwood had been appointed Managing Director in August 1909 following Siddeley's departure. He had resigned late in 1919 due to ill-health. A J McCormack who had been joint MD with Hopwood since 1911 resigned in November 1923 and was replaced by a committee of management. Then, at the end of October 1926, it was disclosed the company was bankrupt "to the tune of £2 million" and Sir Gilbert Garnsey and T W Horton had been appointed joint receivers and managers. It was described as "one of the most spectacular failures in the early history of the motor industry". Other bidders beside General Motors included the Austin Motor Company. Herbert Austin, Wolseley's founder, was said to have been very distressed that he was unable to buy it. Morris had bought an early taxicab; another Wolseley link with Morris was that his Morris Garages were Wolseley agents in Oxford. Morris had unsuccessfully tried to produce a 6-cylinder car. He still wanted his range to include a light six-cylinder car. Wolseley's 2-litre six-cylinder 16–45, their latest development of their postwar Fifteen, "made a deep impression on him". In 1919 Vickers had decided Wolseley should build relatively cheap cars in large quantity – as it turned out – not the right policy. Morris changed this policy before the Wolseley brand might have lost all its luxury reputation. After lengthy deliberation and re-tooling of the works he kept the 2-litre six-cylinder 16–45 Silent Six and introduced a four-cylinder version calling it 12–32. Then an eight-cylinder car was brought to market named 21–60. In September 1928 a six-cylinder 21–60 was announced primarily aimed at the export market and named Wolseley Messenger there. It remained in production until 1935. The Messenger was noted for its robust construction. A very deep section frame reached the full width of the body – incidentally providing the sill between running boards and body. The body itself was all-steel and its prototype was first in UK to have its whole side pressed in one. Wolseley's postwar engines were all of the single overhead-camshaft type, the camshaft driven by a vertical shaft from the crankshaft. The eight-cylinder 21–60 held the vertical shaft in the centre of the engine, and both crankshaft and camshaft were divided at their midpoints. Their smallest engine of 847cc was designed and made for Morris's new Minor at Ward End with the camshaft drive's shaft the spindle of the dynamo driven by spiral bevel gears. But it was relatively expensive to build and inclined to oil leaks, so its design was modified to a conventional side-valve layout by Morris Engines, which was put into production just for Morris cars in 1932. Meanwhile, Wolseley expanded their original design from four to six cylinders. That six-cylinder single OHC engine announced in September 1930 powered the Wolseley Hornet and several famous MG models. This tiny 6-cylinder SOHC engine eventually was made in three different sizes and its camshaft drive continued to evolve from the dynamo's spindle to, in the end, an automatically tensioned single roller chain. As of 2012 the Wolseley marque is owned by SAIC Motor, having been acquired by its subsidiary Nanjing Automobile following the break-up of the MG Rover Group. The Wolseley Sheep Shearing Machinery Company continued trading and is now Ferguson plc. The 1961–69 Wolseley Hornet was based on the Mini. ^ Baker, John. "Herbert Austin". Archived from the original on 16 September 2014. Retrieved 20 June 2014. ^ "The Wolseley Gasoline Carriage". The Horseless Age. 8 (27): 562. 2 October 1901. Retrieved 16 July 2011. ^ "City Notes". The Times (44569). 30 April 1927. p. 18. ^ "Siddeley Autocar". The Times (38805). 16 November 1908. p. 4. ^ a b "Wolseley Motors (Limited). Meeting of Debenture Holders". The Times (42236). 21 October 1919. p. 23. ^ a b "Wolseley Motors". The Times (44389). 29 September 1926. p. 20. ^ "Wolseley House Sold. Purchase by Barclays Bank". The Times (44294). 10 June 1926. p. 16. ^ "City Notes". The Times (44416). 30 October 1926. p. 18. ^ Georgano, N. (2000). Beaulieu Encyclopedia of the Automobile. London: HMSO. ISBN 1-57958-293-1. ^ "Wolseley And M.G. Companies". The Times (47090). 14 June 1935. p. 20. This page was last edited on 23 January 2019, at 18:36 (UTC).